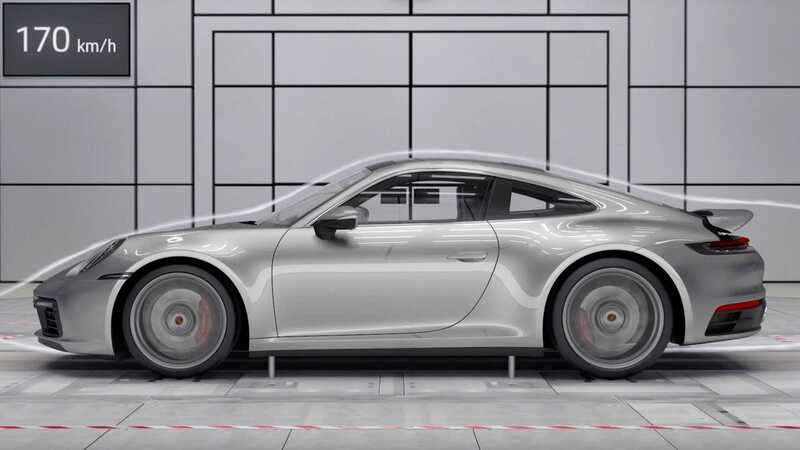 Porsche just uploaded a video on YouTube demonstrating the principles upon which the active aerodynamic kit of the Porsche 911 sports car series is based. The electronically controlled rear spoiler and front bumper flaps serve to both reduce aerodynamic drag and enable the car to come to a halt much faster than it otherwise would. The flaps close completely once the car hits 70 km/h (43 mph). The spoiler activates at 90 km/h (56 mph). Once the sports car reaches 170 km/h, the spoiler gets fully extended and the flaps swing open, producing extra downforce. Whenever the car must rapidly decelerate from higher speeds, the spoiler acts as an air brake. The entire active aerodynamic kit works in perfect unison with another Porsche know-how, the PASM Active Chassis. The 8th generation of the Porsche 911 debuted in the fall of 2018. It retained its exterior appearance while taking advantage of stronger engines, revised interior and a night vision system.